I've always loved movies and music. As a kid, if I wasn't sitting in a movie theater you'd find me at the piano lost in creation with some sort of dramatic scene drifting around my thoughts. "Sounds like a movie," seemed to be the general reaction from family and friends. So, with my passion for creating music and a belief that film is the most powerful of all mediums, the decision to become a film composer was a natural one. My formal training started with classical piano. When I yearned to go beyond finger technique, interpretation, and playing the music of other composers, I found an orchestration and composition teacher who, along with instrumentation, made jazz and traditional theory an integral part of my study. Boston's Berklee College of Music was next, which I found to be the perfect school for a composer who aspires to work in the commercial world. It's also an environment inhabited by excellent musicians from all over the world so you're humbled in one sense, yet inspired to work harder than ever! With good reading chops I was able to land keyboard gigs for live theater. I also did session work on commercials which eventually turned into scoring jobs, and once I did that I knew that scoring was all I wanted to do. 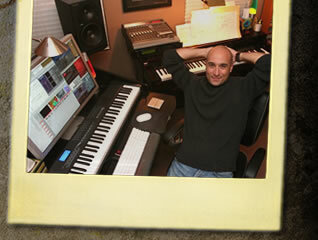 Any kind of scoring -- commercials to infomercials, games to animation, and documentaries to features. All are satisfying in their own way and I bring energy and passion to each project. Over the years I've assembled a state-of-the-art composing-room with the most elite sound libraries, convolution verbs and software plug-ins on the market allowing me the most complete and versatile orchestra at my fingertips! The whole process of scoring to picture is rewarding on so many levels, the spotting session, the piano sketch, the fleshing out with instruments and FX, but at the end of a project, I'm only happy with my contribution if the director is happy! All materials © copyright , Mark Manning and MMTrax.com.